The Thermo Scientific Evolution 201 Spectrophotometer offers you versatile use and consistent, high quality results for your UV-Vis assay needs. Double beam geometry captures any change in ratio to negate the effect of a changing sample, ideal for kinetics and long term processing with this UV-Vis spectrophotometer. A precise monochromator offers you variable scan speeds from <1 to 6000 nm per minute. This uv-vis spectrophotometer employs a xenon lamp, that’s long lasting, and requires no warm up time for instant measurements and increased productivity. 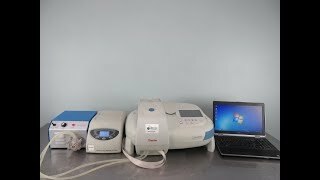 The Thermo Scientific Evolution 201 Spectrophotometer has a simple to navigate onboard computer with a clean interface, with workflows that can be dedicated to specific users, and that can guide through even the most complex assay. This customizable interface can add interactive buttons and step by step instructions, prompting users to complete tasks in sequence, as well as automatically display and store results. The Thermo Scientific Evolution 201 also has trigger connections to help start the next part of your process or signal when a measurement should take place. Data from this spectrophotometer can be exported via USB port to either a pc, a memory device or an external printer. INSIGHT software for this uv-vis spectrophotometer allows you to customize your reports to fit your needs, can be added to to make it 21 CFR Part 11 compliant. The Thermo Scientific Evolution 201 Spectrophotometer also has an array of separate accessories that can be added to give even more robust results and more flexibility to fit your laboratory’s needs. With the use of these accessories you can build your own detector configuration. Contact us today to learn more about UV-Vis Spectrophotometer. Dimensions 24 x 20 x 13 "
This Thermo Evolution 201 Spectrophotometer has been fully inspected and is operating without issue. All of our lab equipment comes backed with out standard warranty. Should you have any questions, please feel free to contact us.